If Mrs. Maxwell Didn't See Mary Who Did She See? When one looks at the complete statement, the person who wrote "H Division" is clearly the writer of one of the signatures. Exactly the same H is used. They're similar, but differ in certain ways. The H on the left (from "H Division") is fluently and confidently wrought, whereas the H on the right (p1 signature) is rather more crude in comparison. Likewise, the flourishes on the upper left hand side of the H are different; the one on the right is a tight, neat little squiggle, the one on the left is loose, open and rather more laboured. Finally, the way the bottom leftmost loop on the H flows through to the upper loop on the right is differently executed in either case. It strikes me that, whoever wrote the H on the left was very used to writing in that way, whilst that whoever wrote the H on the left was writing in a decorative manner in which he was not particularly practiced. bingo. I made this very point with sam a while back. There are three George Hutchinson signatures on the document . The bottom of the first two pages and at the end of the statement followed by Badham and Arnold I think . Page 2 looks natural and flowing , page 1 is an 'artistic' attempt and page 3 the H has been gone over a few times . This statement is ALL that exists of the man supposedly named George Hutchinson , without this he doesn't exist ..... and the one thing it relies upon , namely the signature , is concerning . The Abberline Diaries were discredited by a signature error ..... this statement belongs in the same place .It is no more reliable than them . Let's keep Toppy out of this - I was only referring to what appears on the 1888 witness statement. The "meat" of these signatures is consistent on every page, and only the first "H" in the "Hutchinson" on p1 really differs. This "H" is not written in the same way as the "H" in "H Division", as the above montage shows and my accompanying post explains. And as i've countered in one of my posts earlier today. My own first or second initial can, and does, vary when I need to write more than one signature, especially on the first go. As I've said, this is why I take "practice runs" on scrap paper to get my signature working properly before committing my John Hancock to the official document which I am required to sign. Anyone who disputes this is effectively calling me a liar. I am not lying, because this really happens, and I have frequently experienced it. That being your habit Sam , doesn't make it the norm .I personally have never heard of an adult practicing his signature and certainly not when he is signing important documents . If that's your way then so be it but isn't it time we looked at probabilities as opposed to remote possibilities . Walter Sickert played around with his signature , sometimes he was just Richard Sickert so should we see that as good cause to believe that Abberline would be likely to do the same , and that the Abberline Diaries could be genuine ? I would never call you a liar Sam. I believe you. How could Badham, Elisdon, Arnold & Abberline all sign a document previously signed by 'the man who never was'? Starting to resemble Roger "Verbal" Kint. Whether it's 'fraud' shouldn't really be in any doubt as all three signatures are different .... it's why ? It just strikes me that when someone is intentionally copying the signature of someone else, they take great pains to make sure each signature is identical. A fraudster pays more attention to what he is doing, more than someone who is just casually writing his own set of signatures. Here is a paragraph, or so from the Globe, of 10 Nov. 88. I have not found this in any other newspaper, it offers a few details that are different. "...public house talking to a man. That was the last I saw of her, and it was then half-past nine o'clock" This statement seems to place the hour at which the atrocity was committed almost beyond doubt. Although rumours were current yesterday that the woman had been seen in the morning they could not be authenticated, and the opinion of the police was that the woman had been murdered during the night xxxxx man she took home to her lodgings. This theory xxxxxxxxx now been discarded, for Mrs. Maxwell xxxxxxxxx deceased well by sight, is emphatic xxxxxxxxxxx occasions she saw the deceased yesterday morning and also as to the conversation which passed between them. At half-past nine o'clock yesterday morning, therefore, the deceased was alive, and, according to her own statement was suffering from a drinking bout. 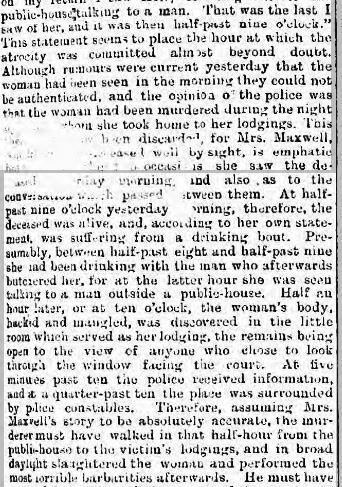 Presumably, between half-past eight and half-past nine she had been drinking with a man who afterwards butchered her, for at the latter hour she was seen talking to a man outside a public house. Half an hour later, or at ten o'clock, the woman's body, hacked and mangled, was discovered in the little room to the view of anyone who chose to look through the window facing the court. At five minutes past ten the place was surrounded by police constables. 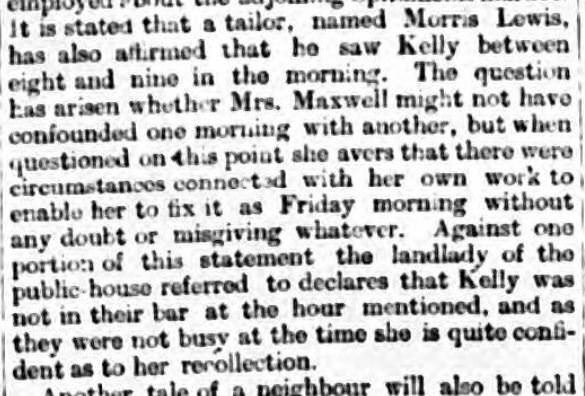 Therefore, assuming Mrs. Maxwell's story to be absolutely accurate, the murderer must have walked in that half-hour from the public-house to the victim's lodgings, and in broad daylight slaughtered the woman and performed the most terrible barbarities afterwards....."
This early account, though inaccurate in some of the stated times, seems to suggest that the police at first were under the impression the murder had been committed over night, but that was discarded. As there were unconfirmed reports (by M.Lewis? ), that the deceased was alive later in the morning. It looks like Mrs. Maxwell's story was taken as confirmation of those unconfirmed reports. This helps us understand the importance coroner Macdonald attributed to this story by requiring Maxwell to appear before the inquest. Last edited by Wickerman; 07-20-2018, 06:51 PM. Daily Telegraph, 12 Nov. 1888.